Middlesex University master's graduate Anna Szczodry has secured an internship with the United Nations Assistance to the Khmer Rouge Trials (UNAKRT) in the Extraordinary Chambers in the Courts of Cambodia (ECCC). The ECCC were created to prosecute the senior leaders of Democratic Kampuchea (the Khmer Rouge-controlled state) and those most responsible for the crimes and serious violations of Cambodia laws related to crimes, international humanitarian law and custom, and international conventions recognised by Cambodia, that were committed between 17 April 1975 and 6 January 1979. During this period, Khmer Rouge leader Pol Pot forced urban residents to move to Cambodia’s rural regions to work in agriculture in an attempt to form a Communist farming society. It is estimated that up to three million people perished under the regime. In 1997 the Cambodian government requested the UN provide assistance in establishing a trial to prosecute the senior leaders of the Khmer Rouge and obtain justice for the victims and survivors of the genocide. Four years later the Cambodian National Assembly passed a law to create a court to try serious crimes committed during the communist Khmer Rouge movement. On the UN placement Anna will be providing assistance to the Supreme Court Chamber. “My responsibilities, among others, will include conducting research on a variety of substantive and procedural issues, assisting in the drafting of legal documents, file preparation, attending court hearings and meetings with judges as well as undertaking work directly on behalf of international judges,” she explains. 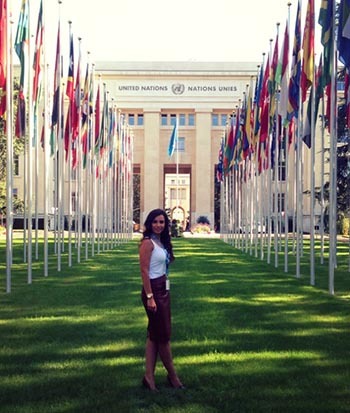 As part of her master’s degree in International Minority Rights Law, Anna, who studied Criminology at Middlesex as an undergraduate, participated in the Practicum in International Organisations where students complete work placements at the United Nations and other European organisations. Through this practical experience they learn more about how important international issues are addressed. “I successfully secured an internship with the United Nations Office of the High Commissioner for Human Rights (OHCHR) in Geneva where I worked for the Treaty Bodies Division,” Anna says. On this placement she was responsible for monitoring issues with regard to tolerance and non-discrimination and for writing and analysing reports relating to racism. The role involved drafting and conducting legal research and providing logistic support to the Committee on Elimination of Racial Discrimination and the Human Rights Committee. She said the internship helped improve her analytical skills and allowed her to strengthen her competencies. “It gave me an opportunity to work in the international environment and collaborate with a diverse range of stakeholders,” she says. The new internship at UNAKRT will provide her with “significant experience” in applying academic research to the decision-making process, she said, as well as a “valuable insight into the functioning of a hybrid tribunal”.